Sweet, romantic, engaging and brimming with palpable angst that made the story incredibly addicting. I loved every word of it and I loved our flawed, but big-hearted bad boy, Travis Maddox. I write this review subsequent to the second experience of reading this book. 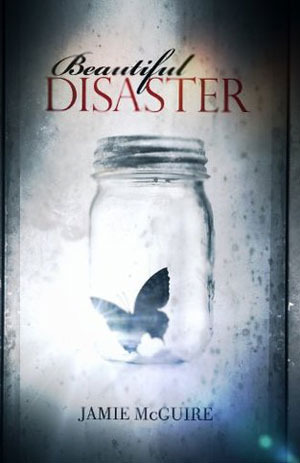 I discovered Beautiful Disaster on Amazon before I started blogging and I’m glad I finally have the opportunity to jot down my thoughts on a book that’s become a classic in the Indie community, and a book I treasure as one that not only gave me an unforgettable story of two unlikely people falling in love, but one that also served as the gateway drug to my addiction to countless other books that led me to doing what I’m doing now… writing about the books I love. So, what can I say that hasn’t already been said about this book? I was consumed by it. Enthralled. I fell in love with it. I was totally sucked in, even a second time, to the intense story of Travis and Abby. Bad boy Travis Maddox fights in The Circle–an underground fighting ring at Eastern University. Fearless, bulging muscles, covered in tattoos and known for the gobs of women surrounding him, he is infamous at Eastern. Always the player and never the one to settle down, Travis is defined by the punches he delivers and the volatility that his life entails. That is, until he meets Abby Abernathy at one of his fights. A girl in the crowd. She wasn’t supposed to be there. Her pink cashmere sweater now splattered with blood. Abby came with her BFF America, who is the girlfriend of Travis’ roommate, Shepley. As their eyes connect across the swarm of students, Travis goes after her. In their first conversation, he calls her Pigeon. There’s just something about her and soon Travis confirms that she is indeed different. She’s not like the other girls that throw themselves at him. In fact, Abby is doing everything possible to make him leave her alone. But Travis is relentless as he begins to lay down the charm…. THICK. Travis is completely amused by Abby. When Travis seems to be going nowhere, they agree to become friends. I loved seeing their banter, their push and pull, and how they come together, slowly relenting to their mutual attraction. They spend so much time with each other–studying, going to parties, snuggling in bed–that the unlikely pair just seem to be right. The angst in this story consumed me! The comes a bet. A bet that would forever change their lives. Abby loses it and has to stay with Travis for one month and of course it’s during that time that they really fall in love. And I too, really fell in love with Travis. I adore just how fiercely he loves Abby. He’s crazy, insanely, intensely over-protective. Typical? No. But Travis? Yes. Despite his rough and overly domineering ways, he’s expressive and honest about how he feels, despite him feeling unworthy. They are both flawed for their own unique reasons, but you can’t help but feel they have to be together. Abby continues to push him away as her past begins to resurrect insecurities. But as the story progresses, Travis’ tendency to mess up prevails and Abby’s stubbornness and fear of the past breaks them apart. These were some tough parts to read because I just wanted them to be together!!! This is simply an unforgettable romance between two unlikely people. They share a love story that is defined by drama, conflict, volatility and as the title alludes… a disaster, but together they are better than apart. It works. They work. Even upon the second time reading this book, I loved it and couldn’t put it down. There’s just something special in this story and it’s a definite must read for any book lover. I’ve read this book three times. LOVE! Another great review Vilma! Loved your review!! I read this book a few months ago within a span of hours – I never wanted the story to end! I loved every second of this and walking disaster!